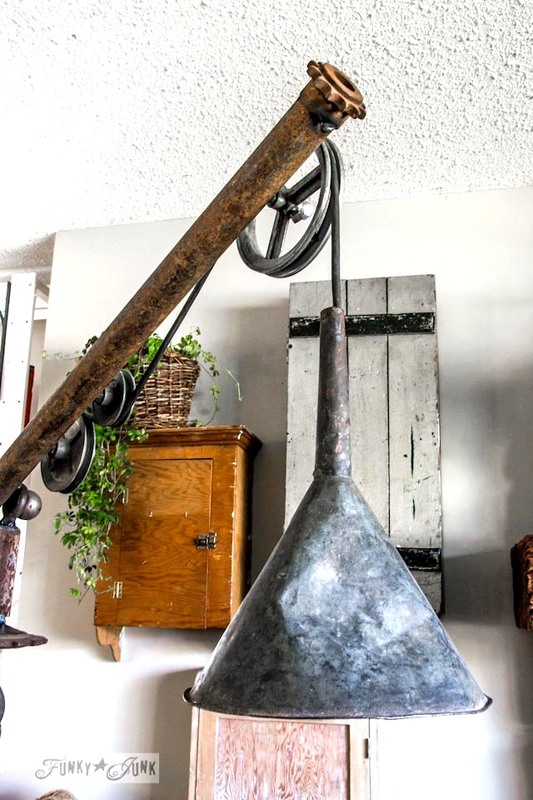 A Pottery Barn inspired oil funnel gear junk lamp. Part 2 – How I wired the lamp is HERE. Welcome to those coming from Wendy’s own Knockoff at The Shabby Nest! 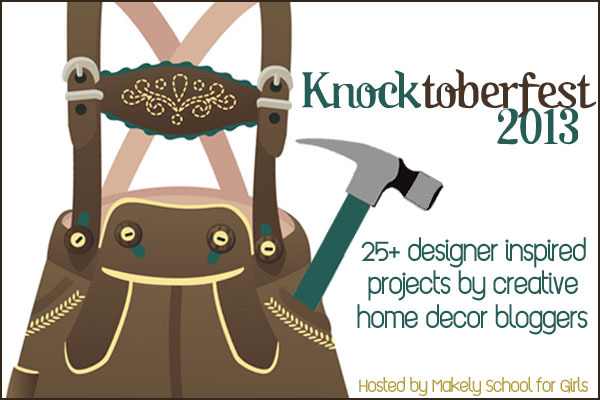 New to Makely School for Girls Knocktoberfest? Every day this week up to 6 bloggers will be sharing their own knockoff projects. Visit all the projects link up style as they go live HERE. 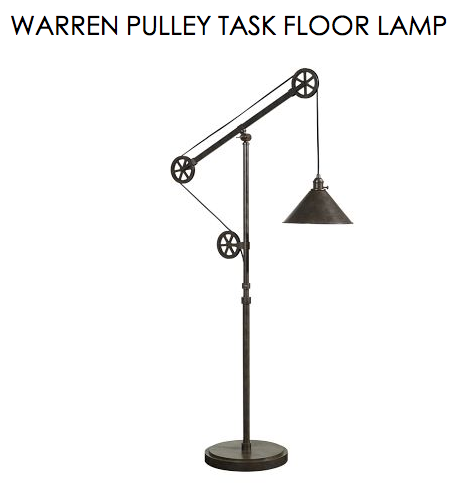 For my challenge, I was inspired by a Pottery Barn Warren Pulley Task Floor Lamp. Hmm… I liked it, but I desired a junky version of it. So my oil funnel gear junk lamp was born! But I needed help, so I called on my artist buddy, Dan of Imagination Corporation. Dan specializes in themed environments (think Disneyland) and knows how to do anything (I can’t imagine!) so I was hoping for some guidance. Now know… I would have loved to have done every single part of this lamp with my own two hands, but sadly, I didn’t earn the privilege. Yet. Dan played it safe and informed me that I needed proper welding training, so he let me art direct while he did the dirty work. THIS time. Come to think if it, this help thing was a pretty sweet arrangement. I could get use to this! 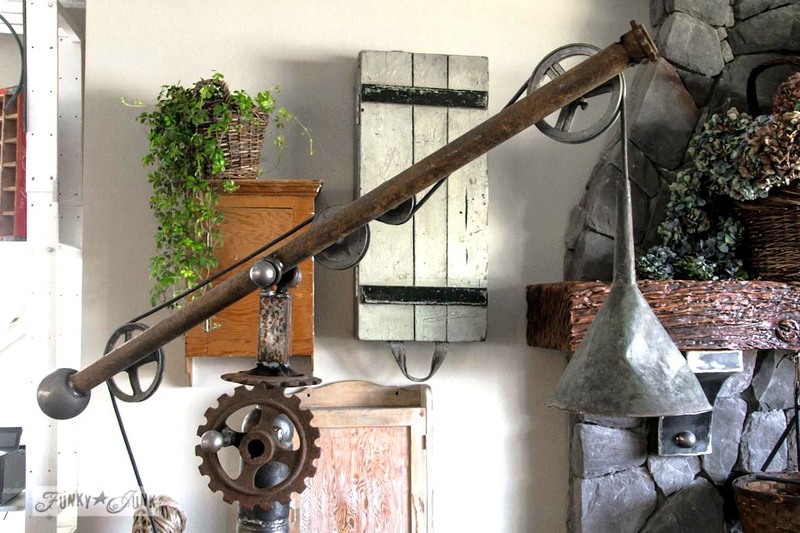 I gathered up an oil funnel, gears, clothesline wheels, and landed an AMAZING rusty old stand at the Extreme Junkin’ for Rust shopping spree. 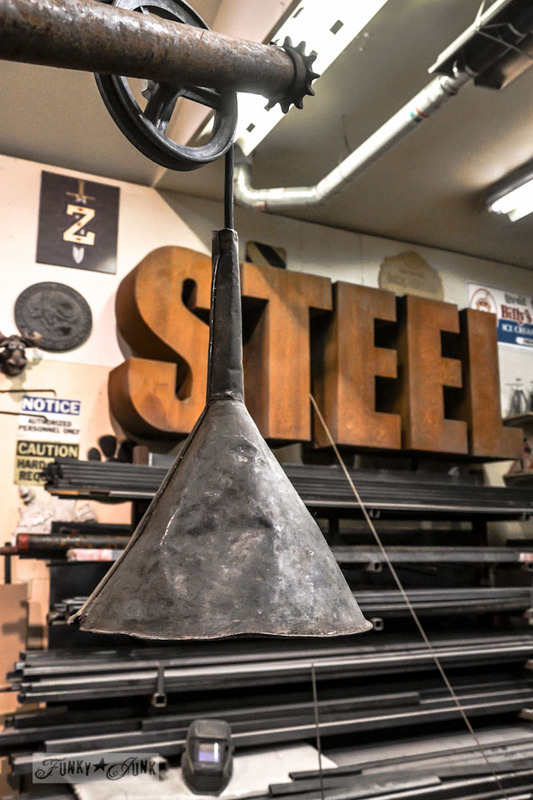 In a nutshell, chunks of metal were decided upon, then cut down to size,then welded together. Kind of like a game of stacking metal blocks. I don’t have a mechanical mind where motors and pulleys come into play so I relied on Dan to set up how the thing would function if it were a real working gear mechanism. He then let me choose what piece I wanted where, and made it happen. 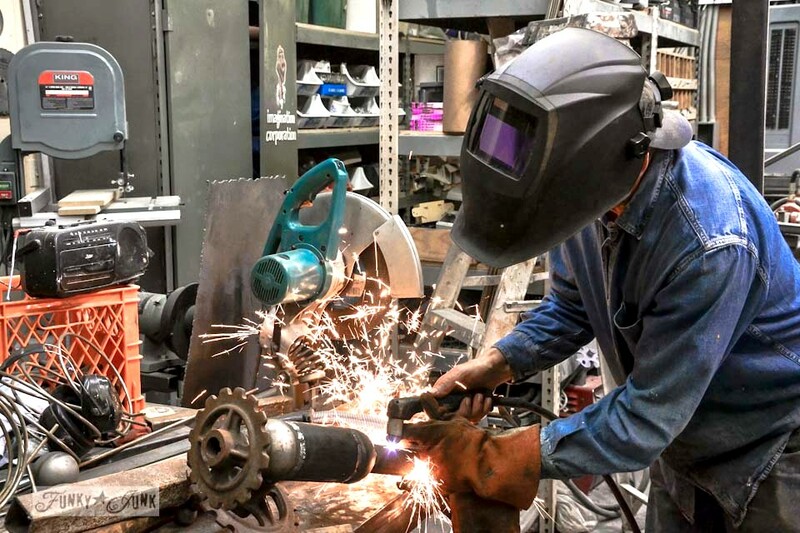 A welder is kind of like a junker in their gathering methods. They have all these interesting metal things, such as that ball and squirrly thick wire that you see above. The more there is to play with, the more you can do. I’m liking the idea of being a welder just fine! Remember my junker brother’s garage sale? Long ago Les picked up that neat old wagon wheel centre piece with me in mind and had just held onto it not knowing if I’d really like it. Um… I need a chat with Les me thinks. I loved it so much it got slipped onto the centre stage of the lamp. Cool! In fact, I’ve gotten so much milage out of his junk ( hydrangea basket filled mantel / cupboards on a wall gallery / crates on a wall phone station / red bench coffee station ) I really hope he has another garage sale soon! The oil funnel lamp shade was a crumply rumply perfect fit! This next part was like decorating a house. The basic structure was there, but we needed some bling for the design to make sense. The clothesline wheels were outfitted with big nuts and bolts, then welded into place on the metal pipe to hold the electrical cord in place. This is one time you WANT to see those nasty cords! 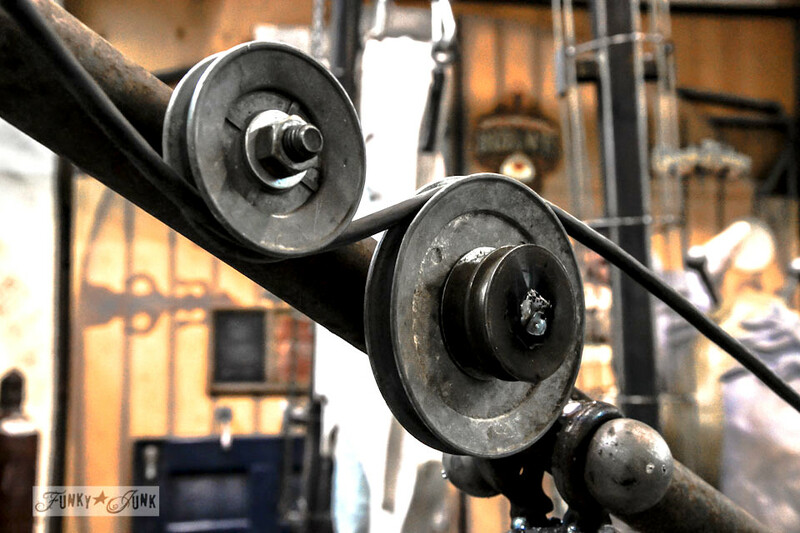 … and the winding gear side. The middle gear has a handle so it really does look like a working mechanism! The lamp base was cleaned up with a stiff wire brush, big nuts and bolts added for more bling, and this guy was ready to come home. Oh my word this crazy thing is HEAVY. It took three of us to get it upstairs. LOL But worth it. Just don’t change your mind on what floor you want it to reside on! A little gear was welded on the end of the pipe for some extra character. 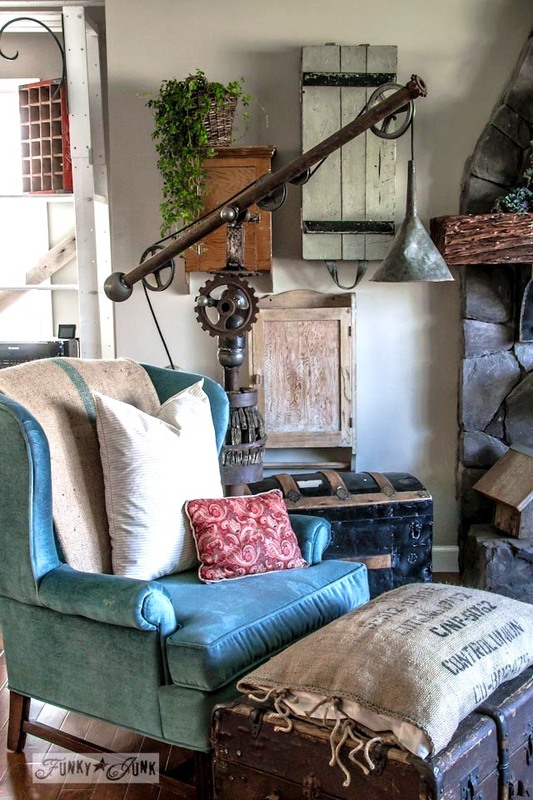 I adore the mix of rust and galvanized metal. Stinkin’ cool or what! Are you still with me here or am I certified beyond hope at this point? Please pin the above image from HERE… pin feature is broken. While the lamp is wired with some super cool heavy duty black cord, I still have to add the finishing touches. I’ll do a lamp wiring from scratch post soon as this was not from a kit. 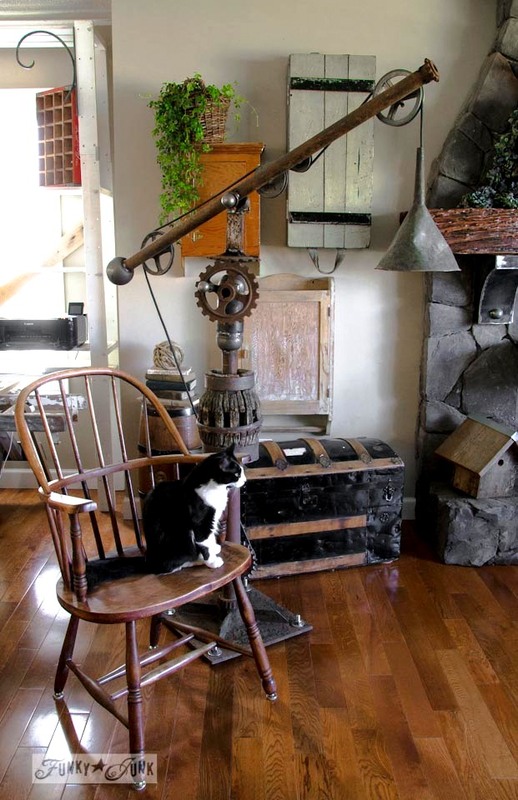 My oil funnel junk lamp is absolutely perfect for my junk inspired home! And you can bet welding lessons are on my to do list! For Tuesday Knockoff #2, visit East Coast Creative live now! I LOVE THAT THING!!!!!! KUDOS!!! Now THAT has to be one of the coolest things ever!!! Way cool !!! Way to rock your parts! Hee Hee! OMGoodness!! This is the coolest thing I have EVER seen!! One of a kind, a keeper for sure. Keep this guy as a friend. Great job! Holy cow, Donna! That is AWESOME! Wow! I thought the first picture was the inspiration lamp from PB, but it was yours. It looks great! LOL!! Now that’s funny! Thanks so much, Jackie! Crazy awesome, Ms. Donna! Kind of like you! Thanks Stacy! 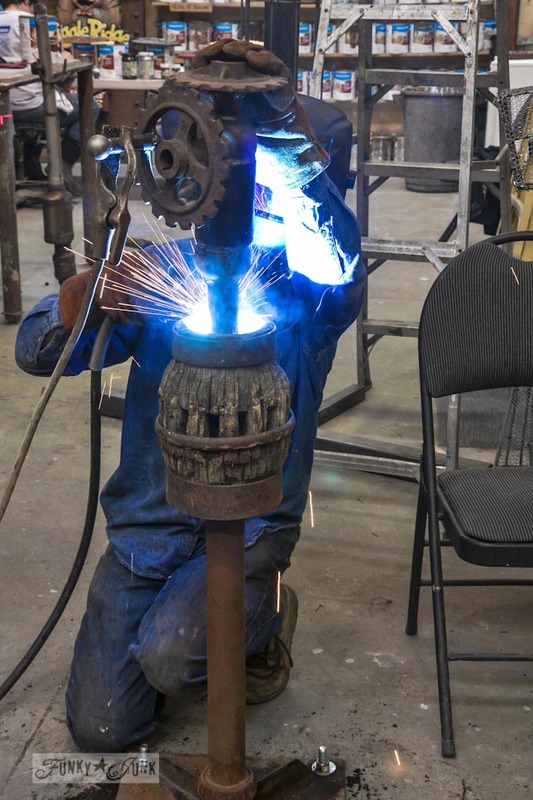 High 5 on the bucket list welding thing. I’ve welded but not enough to have built this myself. I totally need to change that! WOW! I am in love with this lamp, any chance you want to visit MA and make one of these for me lol! You did an incredible job, this is Fantastic!! I am so with you and you ARE certifiable. To solve the problem, you should give me the lamp for my birthday! I have one coming up sometime this year! Seriously, this is beyond cool and I would never get rid of it, if I were you! I’m glad I love it too, because it’s too heavy to get rid of! haha Thank-you! VERY cool, Donna, and so you! Dan did a great job with your obvious design input. Thanks, Julie! Someone like Dan makes me realize how much more there is to learn. And it can’t be soon enough! WOW. That is awesome. I was wondering about Dan, you hadn’t mentioned him in a long time. I’m glad that he is still around to help you and now with a new job in the horizon, learning how to weld. Don’t know if your neck will take that heavy helmet though. Thanks for sharing. Just awesome. Ha! You know me well Joani! I coasted for a good long time with the last chunk of knowledge he shot my way. But I admit I’m anxious to keep learning. I need to have this welding gig in my life. Soon! The helmet wasn’t too bad! I wore one while he worked so I could take pictures. Incredible!! !, Your lamp makes Pottery Barns lamp look like a piece of junk!!!…heheehh. 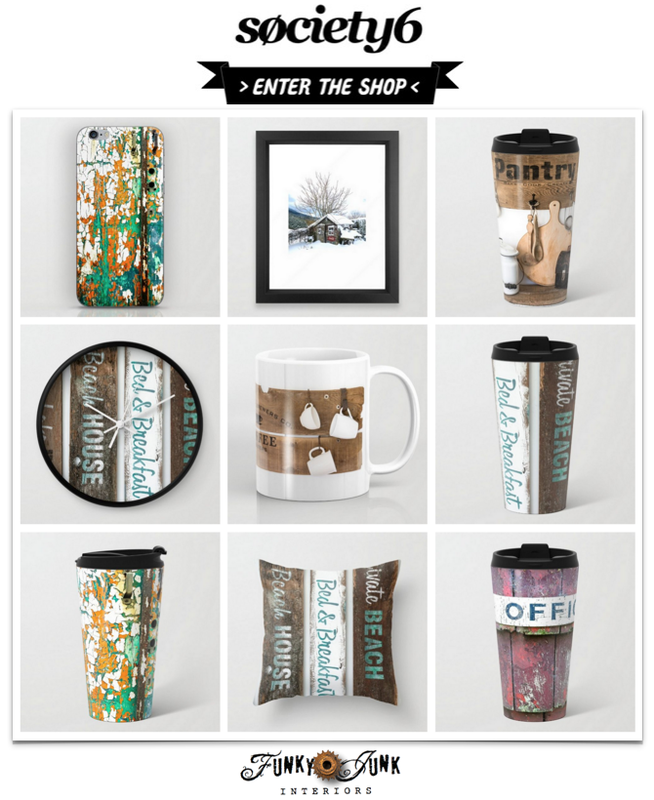 I am overwhelmed by your creativity! OH THE IRONY in your comment made me laugh! Thank-you! I think this certifies you as a Steamfunky Junky! Fabulous lamp! 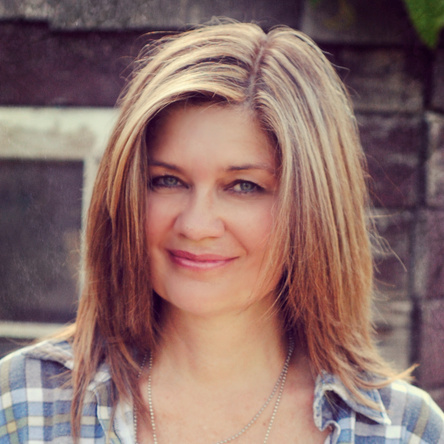 Love your blog and your creative being! i gotta pass on something. this really irks me, and i think that you, as a blogger, should see. i appreciated (immensely) what you offer on your site. you are funny, knowledgable and sincere. you give us tips and offer insight to your inner workings. you are personable and intuitive. i am proud that you are on my blog list…a place where i can go everyday just so i can have a peek into what you want to share of your life. i will take you or any other blogger over martha any day. i have not, nor will i ever, subscribe to anything that i know to have had her hands in it. best wishes, and as always, gimme more! Luckily, her opinions have no effect on me. Bloggers Unite! And thanks so much for your kind words! That is just the coolest looking lamp ever! My husband would go ga-ga over it! I am in love with this! I have such a perfect place for it if you ever tire of it ;)! This is the coolest thing ever! Love, Love, Love it. I wonder if I could get my hubby to help me with one? Wowzers! May I just say that your version kicks the pants off the other one! So much chunkier and with much more ‘junky’ substance. Way cool! You ‘nailed’ it, totally freakin awesome. This is way cooler than PB version. Luv your site! 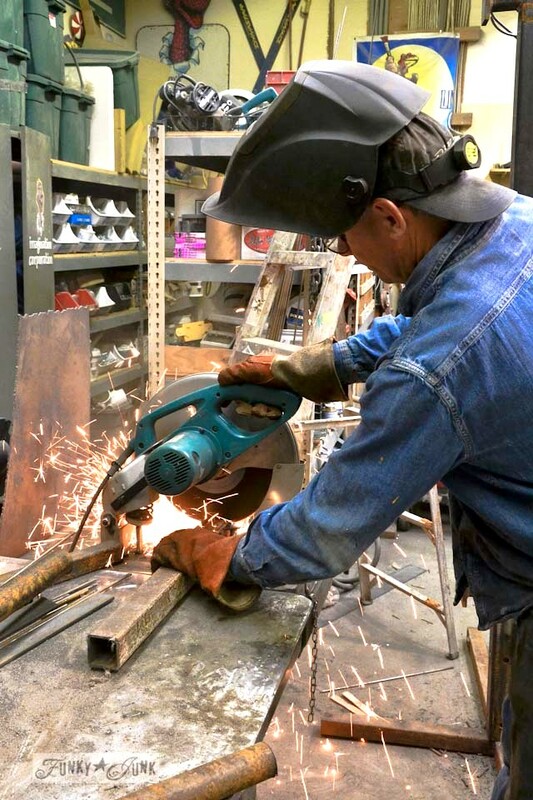 Glad to see Dan welding (my father welded too). Is he using a MIG welder? That is crazy cool! My son is a pipefitter…and I’m thinking I need to put his welding skills to some neat projects (and get him to teach me!). Big time yes! Get him to teach you! This stuff is not hard to do.. it’s just know how! Thanks for the kudos! Big Happy Sigh. What could be better. Dan is such a sweetheart too. Love your lamp. LOVE. 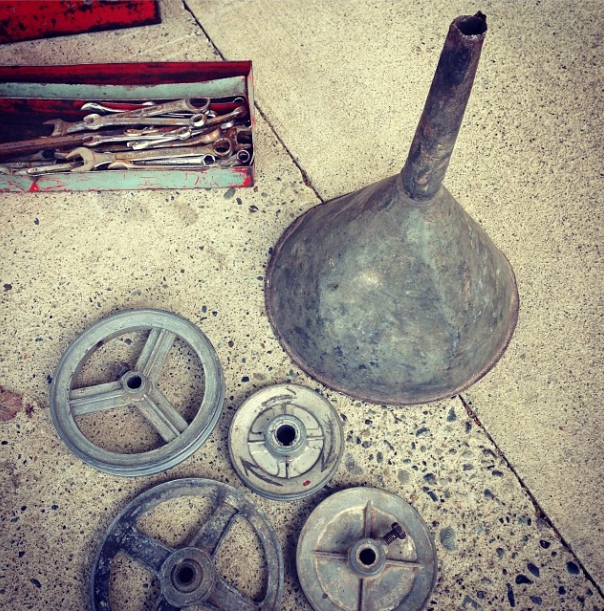 Your brother surely had the best junk to share at his garage sale. 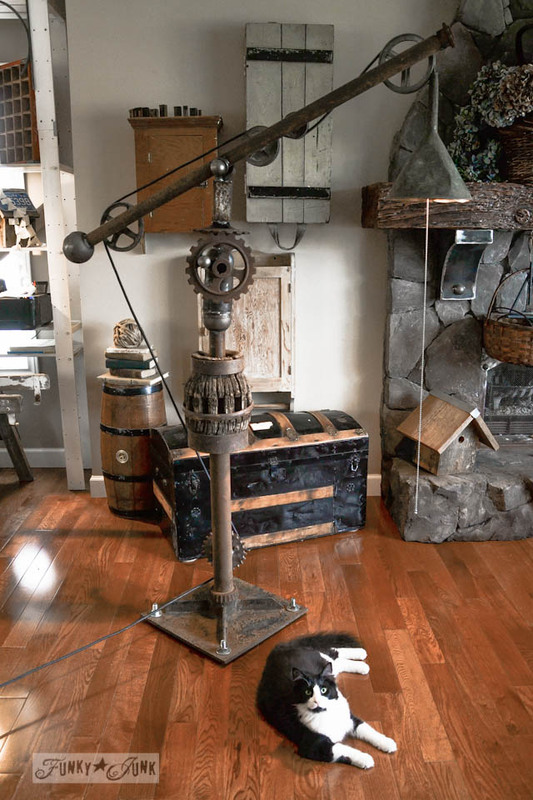 Whew, your lamp is way cooler than pottery barn, more steampunk, more original. Love, love, love… That is COMPLETELY amazing!!!!!!! OhhhhMMMMMmmmGeeeee. Yes stinkin cool. And bonus, it can double as a weapon, just push it over on an intruder. You’d need the intruder’s cooperation to help you… it’s that heavy! HAHAHA Thanks, girl! I love yours way more than the pottery barn one!!!! It is just so freakin cool!!!!! Where can I get me a Dan??? Seriously, do they sell them on Etsy??? Gotta love that guy! No WAY! Yours looks even better than PB! I LOVE this! I’ve had welding on my bucket list for a while and this project just makes the “itch” even worse. 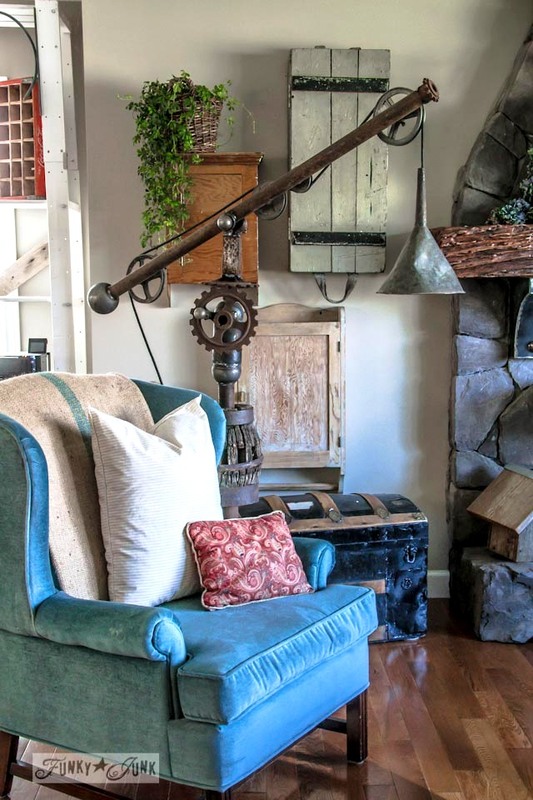 I think what I like most about the lamp is the wagon wheel center. If you had not rescued it, who knows where it might have ended up? And those gears – awesome! Love, love, love! Hi, it’s so cool to see someone who shares the same visions for repurposing. 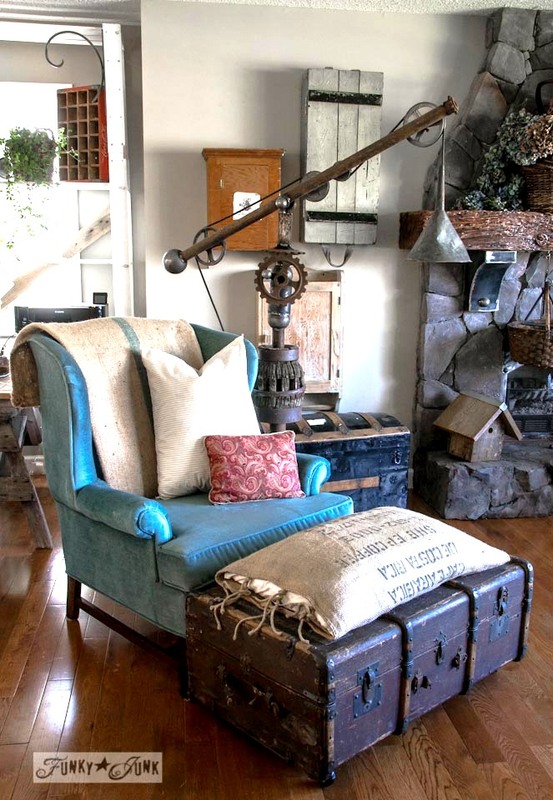 I love all sorts of styles from primitive, industrial, steam punk, etc.. Really like the light it has great character. look forward to seeing more of your work. Donna, this by far, is to me the coolest creation you have posted. I am in awe and inspired. Isn’t that the neat thing about junk? No creation is ever the same, each one is a masterpiece. BRAVO! Keep it up! This is incredible – so amazing! No, I love it, and I like yours much better than the original one. You have some amazing helpfull people in your life. Between your brother and Dan and your imagination you have blog fooder for years. Looking forward to it already! Really creative. I took a welding class at my community college. It is a skill; one that would take me awhile to develop. You have an interesting mind Donna to have fashioned this. Really cool. I love yours much better than the PB version. So much more character. This is way better than the Pottery Barn lamp. I’m into steampunk and Pinned it to my Steampunkstuff. Now, I wish I knew how to weld! Donna, I am speechless, which is rare…that is amazing!!! Wow! I love that lamp. Donna, the lamp is great….fits you to a “T”! Is that Dan’s workshop…I found myself looking at the walls and shelves, and floor to see what other great goodies he had in there! Cool space! So sweet of him to help you with the lamp. A good friend to have around, for sure. I love it, I saw the original in the Pottery Barn catalog and was deciding if “breaking” the bank was worth it! ( For the smaller table top version) My writing nook is in an upper loft of our barn, and is rustic shabby chic! 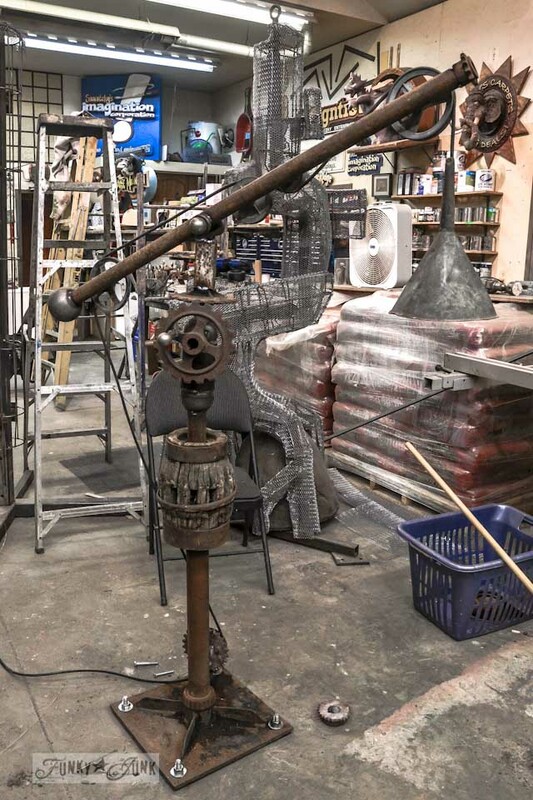 I have a friend whose son is a welder and seeing your adaptation and knowing of a bin that exists full of space stuff ~ I am so inspired. Thank you! That is SERIOUSLY the coolest lamp EVER! That is sooooo neat!!! You are AMAZING!!! YOU go GIRL! Wow, love it! You could make these and sell them! 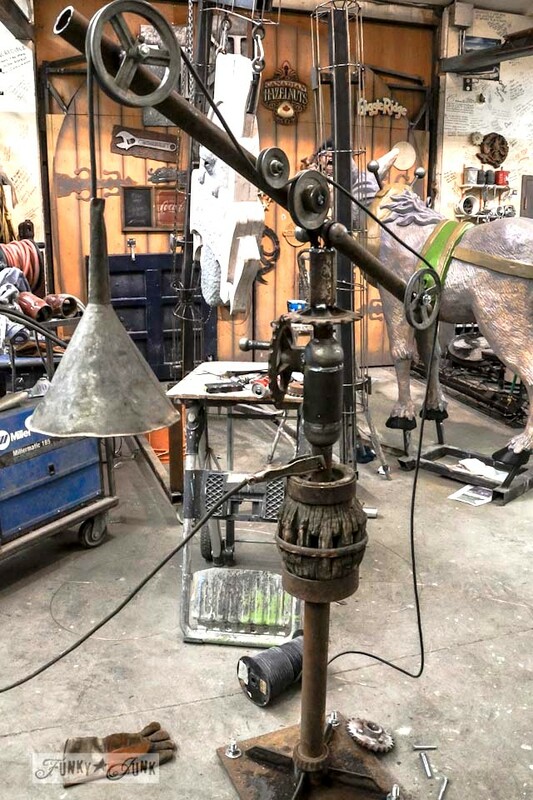 Just had to go back and look at everything else in Dan’s shop – he’s crazy talented!! But then again so are you!! Love the lamp, it’s utterly amazing!!! Love how you inspire me to take a second look at that rusty pile of junk and see what I can come up with! Look at you! I’m so impressed you could put that together! Saw this on pinterest and pinned it. Should have known it came from you. Fabulous! That is the coolest looking lamp. While I was reading the post I was thinking it must weigh a ton! And I had a giggle when you said about trying to get it into place. Love to see a photo of it turned on in the night!? Haha, yeah, it will hold my house in place if there were ever an earthquake! I will indeed get the light working hopefully by tomorrow. Wiring post coming right up! Donna, your lamp is absolutely wonderful and I love it BUT . . . tell Dan I am major intrigued/in love with (what looks like) a draft mule in working harness that you gave us a glimpse of in one of the shots. 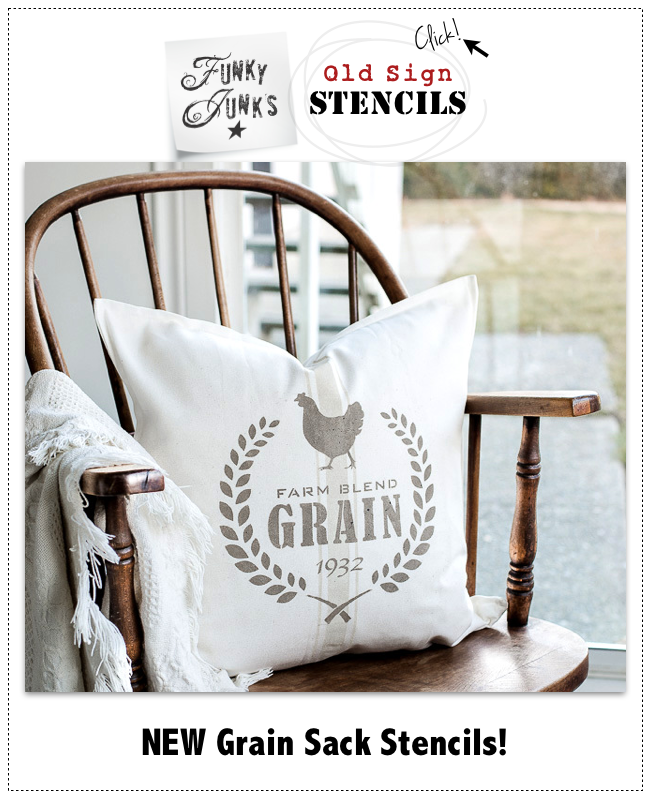 Boy oh boy, do I have THE PERFECT spot in the barn for that!! Well done on the lamp and thanks again for sharing with us. I think of you all as family! Lovely lamp!! !wish my brothers were closer to help with projects.Younger brother would love your creations if he was on-line more.Built his home with high quality leftovers from different jobs(builder/contractor).I love your decorating sensibilities. old,rusty etc…… thank you for your inspiration & bravery !!! Those letters are from a real previous sign job that is no longer. His workshop has the coolest stuff! You’re absolutely right! Stinkin’ cool! Love it! I’m lusting after something similar but don’t want to (won’t) spend the money on it. Just recently I’ve been wondering if I could put some pieces together into something similar. You are inspiring me to go there! Thanks! WOW, Donna! It’s gorgeous! Awesome job! WoW! Lost for words… but you did it again! Donna! This. is. awesome. You rock! I am loving your version so much more! I can’t believe you made that! You are amazing girl! You are unbelievable! I adore this lamp. And your home. Thanks for sharing all your wonderful creations! You never cease to amaze me Donna. I was looking for some fun project ideas and was reeled in by your funky junk. I will be honest, I expected to find a site showing me how to make assorted pencil holders with soup cans and such. I did not expect to see what you have done. It truly is a site of wonderful art. I have been in a trance, day dreaming about where this would go in my home. You have an amazing talent. I will never look at an oil can the same and my husband will never allow me in his garage again. 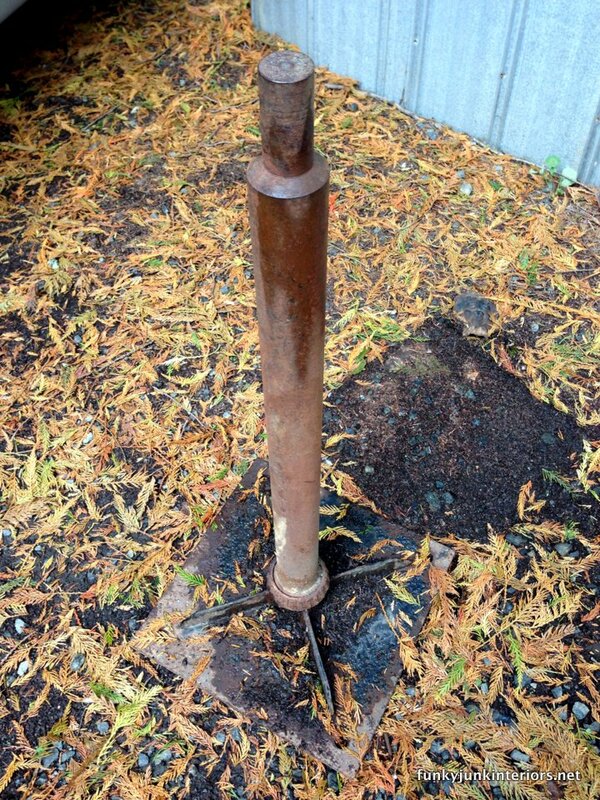 You have also given purpose to an antique crib spring that’s been in our garage rafters. Thank you for making my life exciting and my junk fun. Wow Laura, this is the nicest compliment ever! I do have the soup can mentality going on here too, (haha!) but it’s generally about a little more than that, I agree. I love to make useful things we’d have in our home anyway, but with a unique twist. Glad you liked the lamp! Isn’t it crazy? !